One in 10 pregnant women participating in an extensive study of the drinking habits of US women of childbearing age responded positively that they did, indeed, sometimes consume an alcoholic beverage while pregnant. Older mothers, unmarried women, and college graduates were more likely to drink while pregnant than other expectant mothers. No amount of alcohol is considered safe during pregnancy for a number of reasons, including the risk of a baby being born with fetal alcohol spectrum disorders (FASD). Any alcohol consumption in the previous 30 days. Binge drinking in the previous 30 days. Binge drinking is defined as consuming four or more drinks during a particular occasion. 4% of the survey respondents (8,383 women) were pregnant at the time of the survey. 53.6% of all women reported drinking in the previous 30 days. 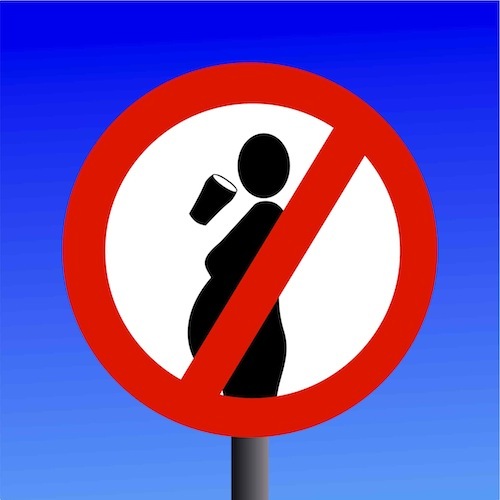 10% of the pregnant women had at least one drink during the 30-day study period. 19% aged 35 to 44. 6.5% with a high school diploma or less education. Single women were 2.4 times more likely than married women to drink while pregnant. 3.1 episodes for non-pregnant women. 7.5 drinks per binge for pregnant women. 6 drinks for non-pregnant women. The binge-drinking rate was highest in non-pregnant women aged 18 to 20, who reported 3.9 episodes in the 30 days prior to the survey and 7.1 drinks on average per binge experience. The high rate and intensity of drinking, including bingeing, in pregnant women may signal a greater degree of alcohol dependency in these women. Over-consumption of alcohol at any time increases the risk of drinking-related illnesses, falls and accidents caused by being off balance, driving accidents, and violence. During pregnancy, it increases the risk of miscarriage, premature delivery, and stillbirth. The CDC reports that between 2% and 5% of all first graders in the US are affected by FASD. The spectrum includes impairments and disabilities that range from emotional, behavioral, and physical disabilities to learning disabilities that lead to poor academic performance. One inherent flaw in all survey-type studies is that the survey respondent relies on memory and recollection, which can be inaccurate, to supply data to the researchers. Another is that people tend to say what they feel the questioner expects or to present themselves in a positive light so the likelihood of under-reporting drinking behaviors is an important consideration when analyzing survey results. "Alcohol Use and Binge Drinking Among Women of Childbearing Age — United States, 2011–2013." CDC / Morbidity and Mortality Weekly Report (MMWR). US Department of Health and Human Services, 25 Sept. 2015. Web. 6 Oct. 2015. "Fetal Alcohol Exposure." NIH / National Institute on Alcohol Abuse and Alcoholism. US Department of Health and Human Services, n.d. Web. 6 Oct. 2015.